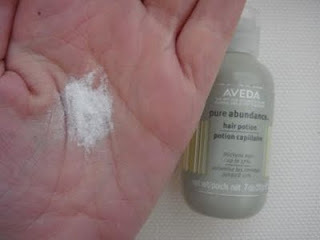 Aveda Pure Abundance Hair Potion recently caught my attention when I was browsing the site so when the PR kindly sent me a sample, I was excited to try it out. 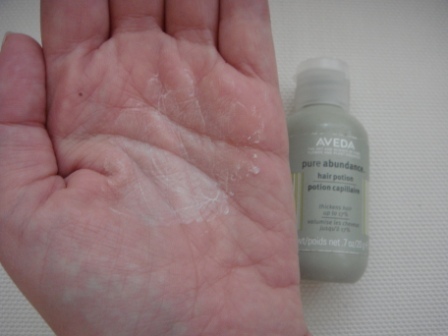 It's a clever little product in that you can use it as a powder (per the first picture below), or "liquified" by rubbing your hands together to create a lightweight lotion (second picture below) before applying to your hair. Aveda Pure Abundance Hair Potion is said to add up to 17% volume to hair. Now I can't comment on the specific stats but I do feel that it does what it says on the tin and adds volume to hair. It's perfect for creating that windswept, summery look as well as adding a matte, not-too-done finish to styles. You only need a little of the product to gain results. I like that the bottle itself is light and therefore easy to carry around, plus it doubles up as a dry shampoo making it ideal for travel or festivals. 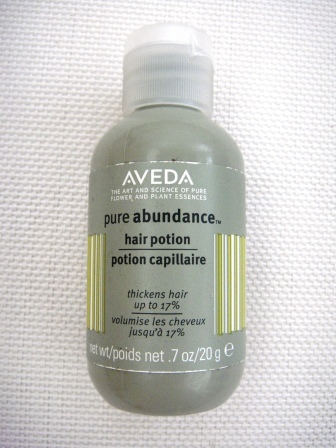 It has a subtle scent of the Aveda botanical blend which makes it feel like a treat to use. Unfortunately, you can feel a sticky residue in your hair which personally, I hated and couldn't wait to rinse it out of my locks (which I found quite difficult to do). For me, it was a downside to the extent that it would put me off using this again. I tend to fiddle with my hair a lot and don't like to feel product in it so perhaps I'd be better off trying to use this to create an up-do. After all, it does add holding power to styles. At £18, it's not cheap but given that it reminded me a lot of the Schwarzkopf Osis Dust It Mattifying Powder, which is £9.55 for half the amount, it's comparable in price to similar products.